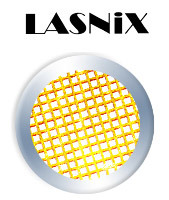 LASNIX offers unique substrate-free infrared components: free-standing metal grids to control polarization and power. Tame high power CO2 and infrared lasers with high precision. High quality polarisation setting and continously variable attenuation of CO2 laser beams. Detect power and polarisation of infrared laser beams fast and with high precision. Monitor THz-MIR-NIR-VIS spectra simultaneously in a compact, permanently aligned instrument.